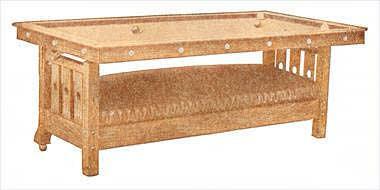 Build a small size billiard table which can be converted into a davenport. Click here for detailed billiard table and davenport plans. The lower part should be made first. Cut the four posts to length, chamfering the ends somewhat so that they will not splinter when in use. Lay out and cut the mortises which are to receive the rails. The lower rails are to be 1-1/8 in. thick and the mortises are to be laid out in the legs so as to bring their outer surfaces almost flush with those of the posts. The upper rails are 2-1/4 in. wide. The slats are 3/4 in. thick. Tenons should be thoroughly pinned to the sides of the mortises as shown in the illustration. The braces are 1-3/4 in. thick and are fastened to place with roundhead screws and glue. The seat may be made by putting in a solid bottom that shall rest upon cleats fastened to the inner surfaces of the rails. The top of this bottom should rest about 3/4 in. below the top edge of the rails. A well filled leather cushion completes this part. A more satisfactory result is obtained by putting in springs and upholstering the seat. Upon this the leather cushion can be placed. The top or table is built upon and about a heavy frame of well seasoned 1-3/4-in. by 5-3/4-in. white pine. The parts to this frame are thoroughly mortised and tenoned together. Middle stretchers, lengthwise and crosswise, give added strength and rigidity. Upon this frame the slate bed is leveled by planing the frame wherever necessary. Slats are fastened to the bed by screws, the heads of which are countersunk so that they may be covered over even with plaster of paris. The top and side facings are built together, the angle being reinforced with block and glue, as shown in detail. These facings, to which the cushions are attached, are afterward made fast to the frame by ornamental headed screws. The detail and photograph show the manner of applying the under facing. Before attaching the top and side facings, the bed cloth should be placed over the slate and fastened. The nap of the cloth should run from the head toward the opposite end of the table. Draw the cloth as tight as possible, taking care that there are no wrinkles. The billiard cushions can be bought ready to cover. 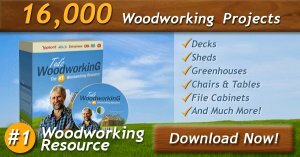 The bumpers which keep the top from striking the front posts can be obtained by making proper selection from oak door bumpers carried in stock by hardware dealers. The brass swing bars, most likely, can be obtained at the same place. 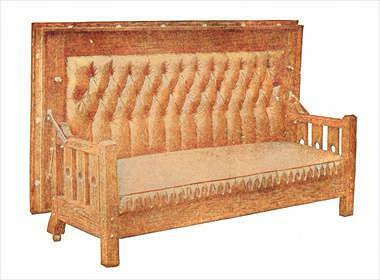 The upholstering on the under side of the top—the back of the davenport—is to be built upon a stout frame made of some suitable common wood, and the whole set in the recess formed as shown in the detail drawing—the whole being fastened from the back before the slate bed is put in position. Effort should be made to select leather of a color that will harmonize with the wood finish which is to be applied.